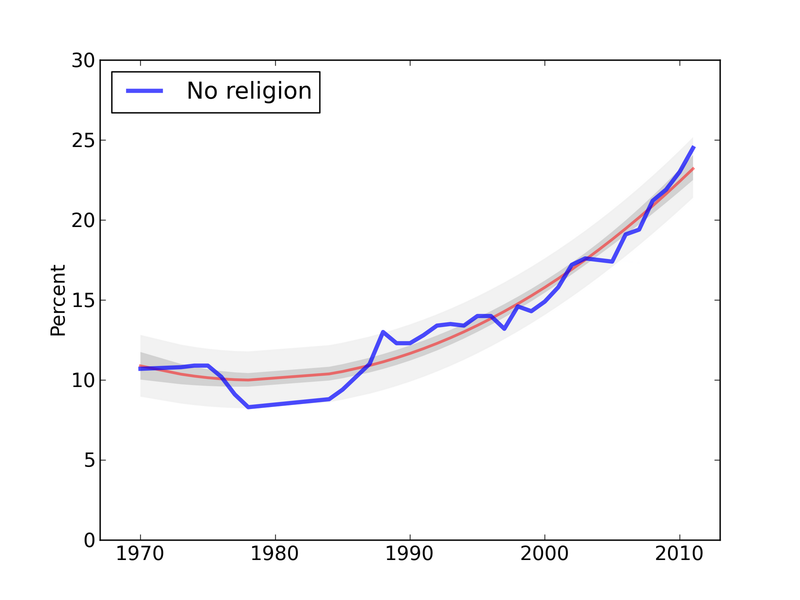 For several years I have been following one of the most under-reported stories of the decade: the fraction of college freshmen who report no religious preference has more than tripled since 1985, from 8% to 25%, and the trend is accelerating. Similarly, students reporting that in the last year they have never attended a religious service has grown from 8% to more than 27%. My analysis is based on survey results from the Cooperative Institutional Research Program (CIRP) of the Higher Education Research Insitute (HERI). In 2011, more than 200,000 students at 270 colleges and universities completed the CIRP Freshman Survey, which includes questions about students’ backgrounds, activities, and attitudes. The red line shows the fitted model; the dark gray area shows the sample error of the model. The lighter gray area shows the sum of the sampling error and the residual error. R² for this model is 0.95; the p-values for the model and the parameters are < 0.001. Subtraction amplifies noise, so for this model R² is only 0.24, but the p-value of the slope is 0.002, so this data provides strong evidence of acceleration. The slope is 0.035 percentage points per year. 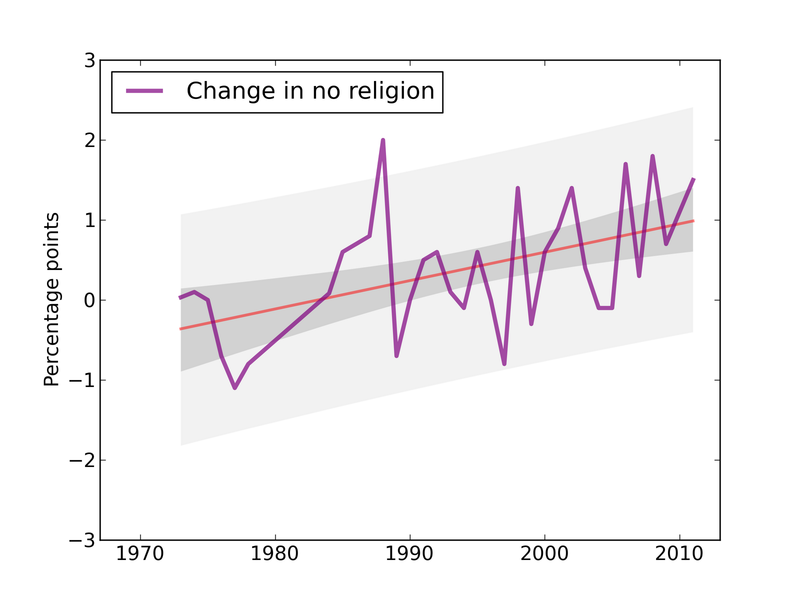 Based on this model, the predicted change for next year is 1 percentage point, so we expect the fraction of freshmen reporting no religious preference to be 26%. R² for this model is 0.44; the slope is 0.035 percentage points per year, with p-value < 0.0001. College students are hardly a random sample of the population. People with more education are less likely to believe in heaven, the devil, miracles, and the literal truth of the Christian Bible. However, contrary to many people’s expectations, educated people are more likely to attend services. So, we expect the students in this sample to be less believing than the general population but also more observant. 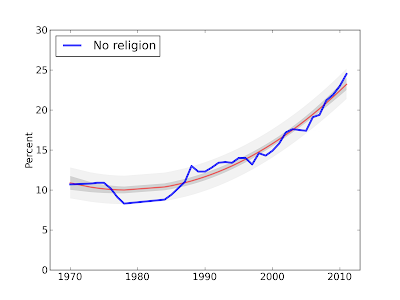 There is reason to think that the rate of secularization in the general population is faster than what we see in this sample. Over the lifetime of the CIRP survey, college education has democratized; the percentage of high-school graduates who enter college immediately after graduation has increased from roughly 50 percent in 1970 to 65 percent in 2003. Over this time, CIRP has included more poor students, more racial minorities, and more students from families with less education. These groups tend to be more religious than the general population, so we expect their participation to increase the religiosity in the sample. 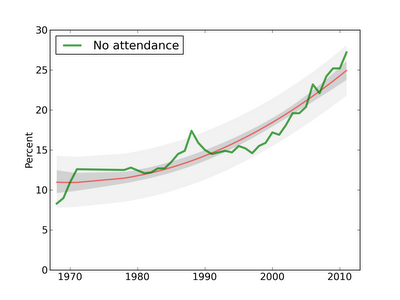 Thus, the observed decrease probably underestimates the trend in the general population. The theory of secularization—that there is a global, long-term trend away from religion—is controversial. Early sociologists, notably Max Weber, hypothesized that secularization is a predictable effect of rationalization—the increasing tendency for social actions to be based on reason rather than emotion or tradition. In the 1950s and 1960s, many sociologists of religion defended strong theories of secularization, but, since then, several of them—including Peter Berger and Harvey Cox—have reversed their positions, arguing that religion is resurging in some areas, including the United States. The data presented here speak directly to this debate. 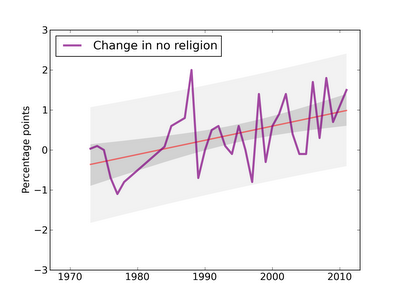 The CIRP survey has posed almost the same questions to a large sample of a consistently defined group for almost forty years, and the results show a clear and consistent trend away from both identification with religious sects and participation in religious services. 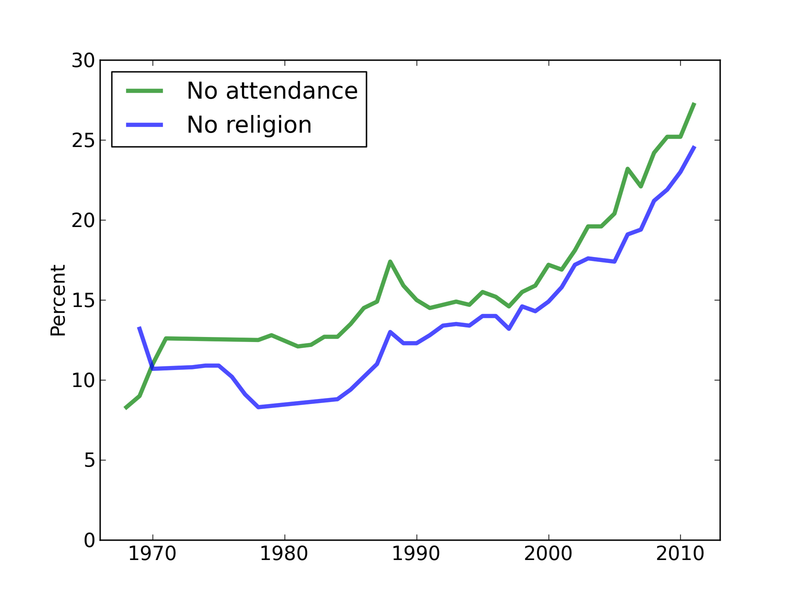 These data make a strong case for secularization in the United States that has, if anything, accelerated in the last decade. Data from the 2011 CIRP Survey are reported in The American Freshman: National Norms for Fall 2011, Pryor, J. H., DeAngelo, L., Palucki Blake, L., Hurtado, S., & Tran, S., Jan 2012. 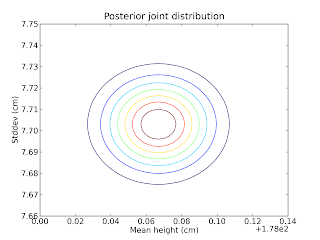 In the previous installment I outlined the topics in Think Complexity and contrasted a classical physical model of planetary orbits with an example from complexity science: Schelling's model of racial segregation. In this installment I outline some of the ways complexity differs from classical science. When I describe this book to people, I am often asked if this new kind of science is a paradigm shift. I don't think so, and here's why. Thomas Kuhn introduced the term ``paradigm shift'' in The Structure of Scientific Revolutions in 1962. It refers to a process in the history of science where the basic assumptions of a field change, or where one theory is replaced by another. He presents as examples the Copernican revolution, the displacement of phlogiston by the oxygen model of combustion, and the emergence of relativity. The development of complexity science is not the replacement of an older model, but (in my opinion) a gradual shift in the criteria models are judged by, and in the kinds of models that are considered acceptable. For example, classical models tend to be law-based, expressed in the form of equations, and solved by mathematical derivation. Models that fall under the umbrella of complexity are often rule-based, expressed as computations, and simulated rather than analyzed. Not everyone finds these models satisfactory. I repeated the simulation dozens of times, for other random initial conditions and for other numbers of oscillators. Sync every time. [...] The challenge now was to prove it. Only an ironclad proof would demonstrate, in a way that no computer ever could, that sync was inevitable; and the best kind of proof would clarify why it was inevitable. Strogatz is a mathematician, so his enthusiasm for proofs is understandable, but his proof doesn't address what is, to me, the most interesting part the phenomenon. In order to prove that ``sync was inevitable,'' Strogatz makes several simplifying assumptions, in particular that each firefly can see all the others. In my opinion, it is more interesting to explain how an entire valley of fireflies can synchronize despite the fact that they cannot all see each other. Think Complexity discusses how this kind of global behavior emerges from local interactions. Explanations of these phenomena often use agent-based models, which explore (in ways that would be difficult or impossible with mathematical analysis) the conditions that allow or prevent synchronization. I am a computer scientist, so my enthusiasm for computational models is probably no surprise. I don't mean to say that Strogatz is wrong, but rather that people disagree about what questions to ask and what tools to use to answer them. These decisions are based on value judgments, so there is no reason to expect agreement. Nevertheless, there is rough consensus among scientists about which models are considered good science, and which others are fringe science, pseudoscience, or not science at all. I claim, and this is a central thesis of the book, that the criteria this consensus is based on change over time, and that the emergence of complexity science reflects a gradual shift in these criteria. Continuous→discrete: Classical models tend to be based on continuous mathematics, like calculus; models of complex systems are often based on discrete mathematics, including graphs and cellular automata. Linear→non-linear: Classical models are often linear, or use linear approximations to non-linear systems; complexity science is more friendly to non-linear models. One example is chaos theory, which explores the dynamics of systems of non-linear equations. Deterministic→stochastic: Classical models are usually deterministic, which may reflect underlying philosophical determinism; complex models often feature randomness. Abstract→detailed: In classical models, planets are point masses, planes are frictionless, and cows are spherical (see http://en.wikipedia.org/wiki/Spherical_cow). Simplifications like these are often necessary for analysis, but computational models can be more realistic. One, two→many: In celestial mechanics, the two-body problem can be solved analytically; the three-body problem cannot. Where classical models are often limited to small numbers of interacting elements, complexity science works with larger complexes (which is where the name comes from). Homogeneous→composite: In classical models, the elements tend to be interchangeable; complex models more often include heterogeneity. These are generalizations, so we should not take them too seriously. And I don't mean to deprecate classical science. A more complicated model is not necessarily better; in fact, it is usually worse. Also, I don't mean to say that these changes are abrupt or complete. Rather, there is a gradual migration in the frontier of what is considered acceptable, respectable work. Some tools that used to be regarded with suspicion are now common, and some models that were widely accepted are now regarded with scrutiny. For example, when Appel and Haken proved the four-color theorem in 1976, they used a computer to enumerate 1,936 special cases that were, in some sense, lemmas of their proof. At the time, many mathematicians did not consider the theorem truly proved. Now computer-assisted proofs are common and generally (but not universally) accepted. Conversely, a substantial body of economic analysis is based on a model of human behavior called ``Economic man,'' or, with tongue in cheek, Homo economicus. Research based on this model was highly-regarded for several decades, especially if it involved mathematical virtuosity. More recently, this model is treated with more skepticism, and models that include imperfect information and bounded rationality are hot topics. At this point I have laid out a lot of ideas for one article, and explained them very briefly. Think Complexity gets into these topics in more detail, but I will stop here for now. Next time I will talk about related shifts in engineering and (a little farther afield) in ways of thinking. On Friday I turned in the manuscript for Think Complexity, which will be published by O'Reilly Media in March (or, at least, that's the schedule). For people who can't stand to wait that long, I am going to publish excerpts here. And if you really can't wait, you can read the free version at thinkcomplex.com. Data structures and algorithms: A data structure is a collection of data elements organized in a way that supports particular operations. For example, a Python dictionary organizes key-value pairs in a way that provides fast mapping from keys to values, but mapping from values to keys is slower. An algorithm is a mechanical process for performing a computation. Designing efficient programs often involves the co-evolution of data structures and the algorithms that use them. For example, in the first few chapters I present graphs, data structures that implement graphs, and graph algorithms based on those data structures. Python programming: Think Complexity picks up where Think Python leaves off. I assume that you have read that book or have equivalent knowledge of Python. I try to emphasize fundamental ideas that apply to programming in many languages, but along the way I present some useful features that are specific to Python. 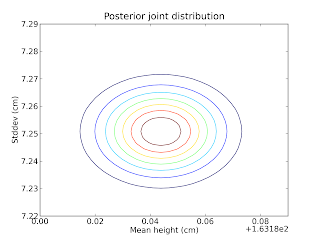 Computational modeling: A model is a simplified description of a system used for simulation or analysis. 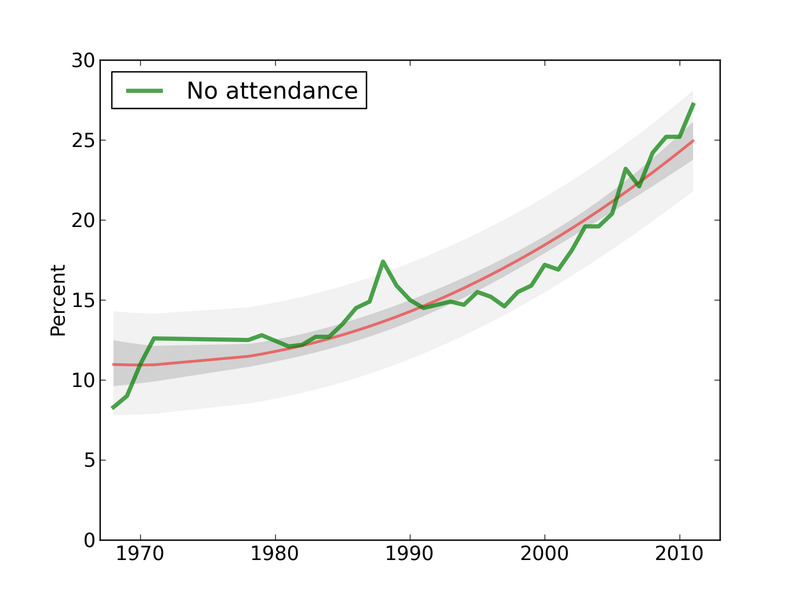 Computational models are designed to take advantage of cheap, fast computation. Philosophy of science: The experiments and results in this book raise questions relevant to the philosophy of science, including the nature of scientific laws, theory choice, realism and instrumentalism, holism and reductionism, and epistemology. The book is also about complexity science, which is an interdisciplinary field---at the intersection of mathematics, computer science and natural science---that focuses on discrete models of physical systems. In particular, it focuses on complex systems, which are systems with many interacting components. 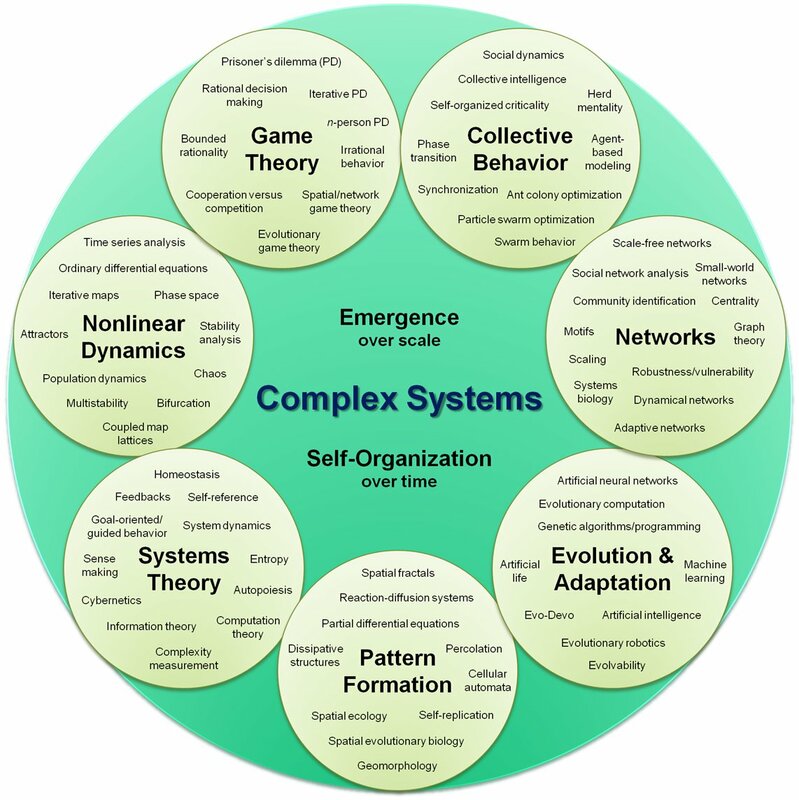 Complex systems include networks and graphs, cellular automata, agent-based models and swarms, fractals and self-organizing systems, chaotic systems and cybernetic systems. Here is a framework for these topics (from http://en.wikipedia.org/wiki/Complex_systems). In 2002 Stephen Wolfram published A New Kind of Science where he presents his and others' work on cellular automata and describes a scientific approach to the study of computational systems. There's a chapter about cellular automata in the book, but for now I'm going to borrow his title for something a little broader. To demonstrate the difference, I'll start with an example of classical science: suppose someone asked you why planetary orbits are elliptical. You might invoke Newton's law of universal gravitation and use it to write a differential equation that describes planetary motion. Then you could solve the differential equation and show that the solution is an ellipse. Voila! Most people find this kind of explanation satisfying. It includes a mathematical derivation---so it has some of the rigor of a proof---and it explains a specific observation, elliptical orbits, by appealing to a general principle, gravitation. Let me contrast that with a different kind of explanation. Suppose you move to a city like Detroit that is racially segregated, and you want to know why it's like that. If you do some research, you might find a paper by Thomas Schelling called ``Dynamic Models of Segregation,'' which proposes a simple model of racial segregation (you can download the paper here). The Schelling model of the city is an array of cells where each cell represents a house. The houses are occupied by two kinds of agents, labeled red and blue, in roughly equal numbers. About 10% of the houses are empty. Most obviously, the Schelling model is highly abstract, which is to say not realistic. It is tempting to say that people are more complex than planets, but when you think about it, planets are just as complex as people (especially the ones that have people). Both systems are complex, and both models are based on simplifications; for example, in the model of planetary motion we include forces between the planet and its sun, and ignore interactions between planets. The important difference is that, for planetary motion, we can defend the model by showing that the forces we ignore are smaller than the ones we include. And we can extend the model to include other interactions and show that the effect is small. For Schelling's model it is harder to justify the simplifications. To make matters worse, Schelling's model doesn't appeal to any physical laws, and it uses only simple computation, not mathematical derivation. Models like Schelling's don't look like classical science, and many people find them less compelling, at least at first. But as I will try to demonstrate, these models do useful work, including prediction, explanation, and design. One of the goals of Think Complexity is to explain how. In the next excerpt, I will present some of the ways I think complexity science differs from classical science. But in the meantime I welcome comments on Part One. I have a soft spot for crank science. Recently I visited Norumbega Tower, which is an enduring monument to the crackpot theories of Eben Norton Horsford, inventor of double-acting baking powder and faux history. But that's not what this article is about. "originated in the early nineteenth century with Johann Meckel, who argued that males have a greater range of ability than females, especially in intelligence. In other words, he believed that most geniuses and most mentally retarded people are men. Because he considered males to be the 'superior animal,' Meckel concluded that females' lack of variation was a sign of inferiority." I particularly like the last part, because I suspect that if it turns out that women are actually more variable, Meckel would take that as a sign of inferiority, too. Anyway, you will not be surprised to hear that evidence for the Variability Hypothesis is mixed at best. The average height for men is 178 cm; the average height for women is 163 cm. 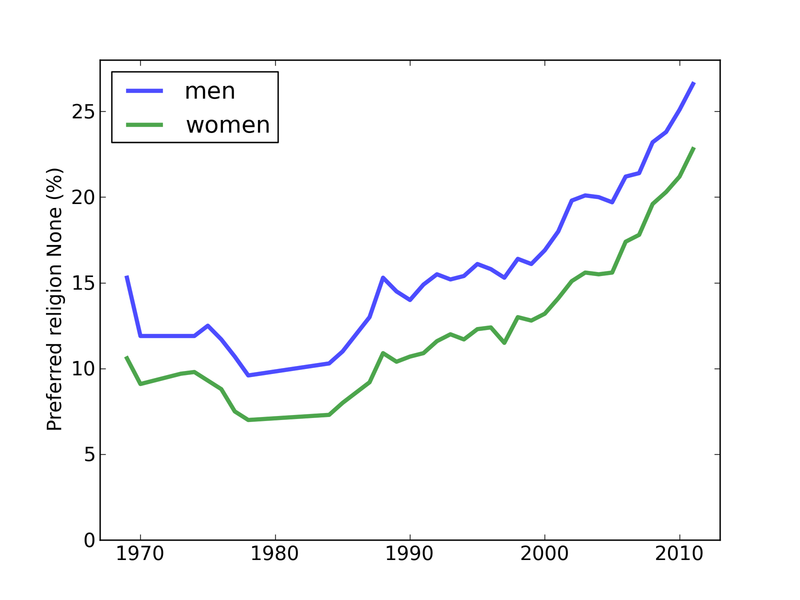 So men are taller, on average. No surprises so far. For men the standard deviation is 7.7 cm; for women is it 7.3 cm. 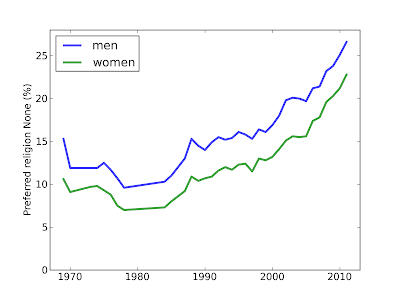 So in absolute terms, men's heights are more variable. 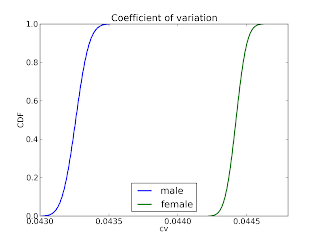 But to compare variability between groups, it is more meaningful to use the coefficient of variation (CV), which is the standard deviation divided by the mean. It is a dimensionless measure of variability relative to scale. For men CV is 0.0433; for women it is 0.0444. 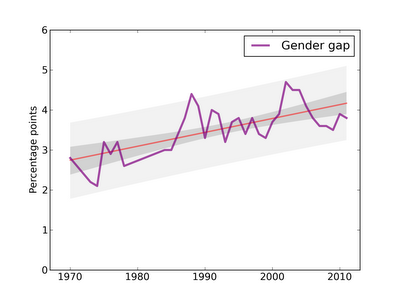 That's very close, so we could conclude that this dataset provides no support for the Variability Hypothesis. But in keeping with the theme of this blog, I won't be happy until I have overthought the question. 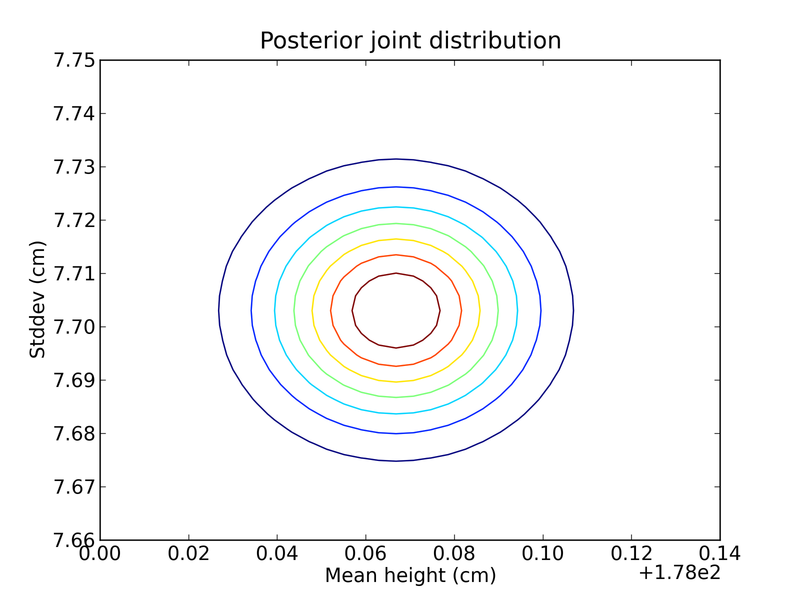 And along the way I want to use this problem to demonstrate Bayesian estimation in 2 dimensions. In previous articles I have presented Bayesian estimation for the number of species in a biological sample and the age of a renal tumor. But those are both 1-D problems. Estimating the mean and variance of a sample is a 2-D problem. 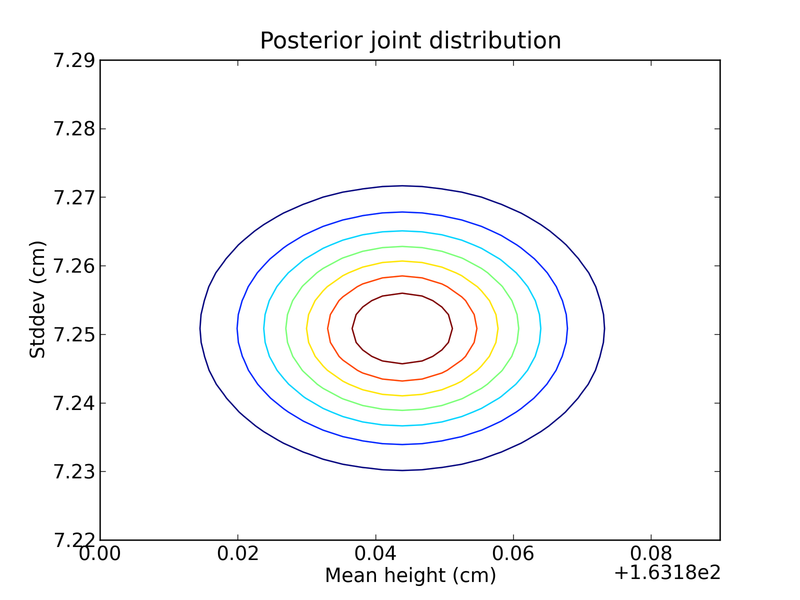 There are analytic solutions for several forms of the prior distribution, but as usual I will demonstrate a computational approach. suite is a Pmf object that maps from each hypothesis to its probability. While we're performing the update, the probabilities are unnormalized, which is why they are called likelihoods. And the whole thing happens under a log transform, because otherwise the likelihoods get so small they get rounded off to zero (see underflow). evidence is the tuple of heights in centimeters; hypo is a tuple of hypothetical values for mu and sigma. Summation computes the sum of the squared deviations from mu; the return value is the log likelihood of getting this sample from a Gaussian distribution with the hypothetical parameters. That's it for the update. Now we need a prior. One option is a uniform prior where mu can be any value and sigma can be any positive value. In practice, there is no point in evaluating values far from the true parameters, because their likelihoods will be vanishingly small. So we'll use the data to choose the range for the prior, then use the data to update the prior. That might sound completely bogus, because we are using the same data twice. But choosing the range for the prior is just a computational convenience; it has no effect on the result, as long as the range is wide enough that the likelihood for values outside the range is effectively zero. Ok, that was more code than I usually put in these articles. You can download it all from thinkcomplex.com/bayes_height.py. 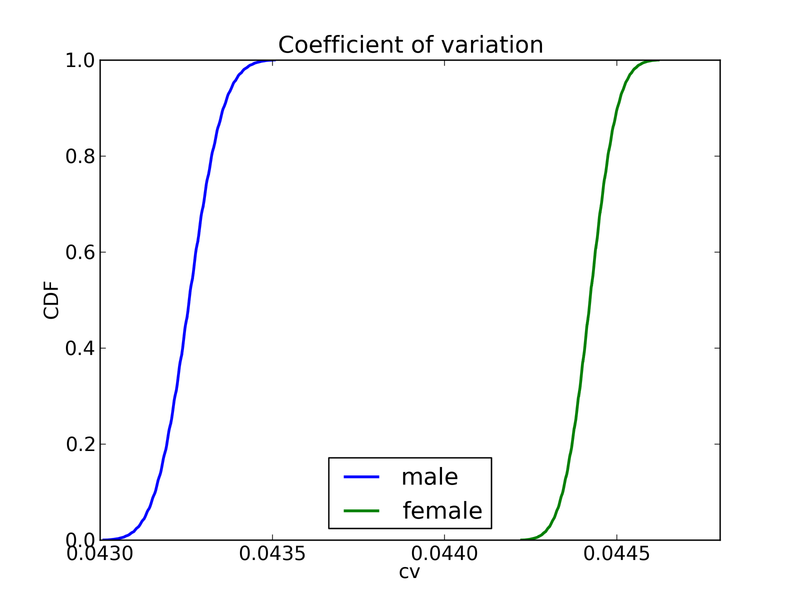 Since there is no overlap between the distributions, we can conclude that the small observed difference is statistically significant; or, if we want to be more Bayesian about it, we can compute the probability that the CV for women is higher, which is pretty close to 1. The standard deviation of height for men is higher. But the coefficient of variation is slightly lower. Even though the difference is tiny, it is very unlikely to be due to chance. And therefore women are inferior. Hey, I told you I have a soft spot for crank science. My friend Ted Bunn wrote an article, "Who knows what evil lurks in the hearts of men? The Bayesian doesn’t care," inspired in part by one of my posts, "Repeated tests: how bad can it be?" Frank and Betsy are wondering whether a particular coin is a fair coin (i.e., comes up heads and tails equally often when flipped). Frank, being a go-getter type, offers to do some tests to find out. He takes the coin away, flips it a bunch of times, and eventually comes back to Betsy to report his results. Frank is an honest man, who has followed completely orthodox (frequentist) statistical procedure. To be specific, he decided on the exact protocol for his test (including, for some reason, the decision to do 3022 trials) in advance. Frank is a scoundrel who, for some reason, wants to reach the conclusion that the coin is unfair. He comes up with a nefarious plan: he keeps flipping the coin for as long as it takes to reach that 1% significance threshold, and then he stops and reports his results. Finally, Ted asks, "What should Betsy conclude on the basis of the information Frank has given her?" If you want to know Ted's answer, you have to read his article (and you should -- it is very interesting). But I'm going to give you my answer: Frank is a scoundrel. Well, probably. I'll follow Ted by making one more assumption: "Suppose that Betsy’s initial belief is that 95% of coins are fair — that is, the probability P that they come up heads is exactly 0.5." Now we can evaluate the evidence that Frank is a scoundrel. Betsy believes that P(fair coin) is 95% and P(biased coin) is 5%. Since Frank's significance level is 1%, P(false positive | fair coin) is 1%. As x and y get small, the likelihood ratio is (1 / 0.0595), which is about 17. So that is fairly strong evidence that Frank is a scoundrel. I don't know about Betsy's prior beliefs about Frank, so you will have to fill in your own punchline about her posterior.